We’d love your help. Let us know what’s wrong with this preview of Progressive New World by Marilyn Lake. The paradox of progressivism continues to fascinate more than one hundred years on. Democratic but elitist, emancipatory but coercive, advanced and assimilationist, Progressivism was defined by its contradictions. In a bold new argument, Marilyn Lake points to the significance of turn-of-the-twentieth-century exchanges between American and Australasian reformers who shared The paradox of progressivism continues to fascinate more than one hundred years on. Democratic but elitist, emancipatory but coercive, advanced and assimilationist, Progressivism was defined by its contradictions. In a bold new argument, Marilyn Lake points to the significance of turn-of-the-twentieth-century exchanges between American and Australasian reformers who shared racial sensibilities, along with a commitment to forging an ideal social order. 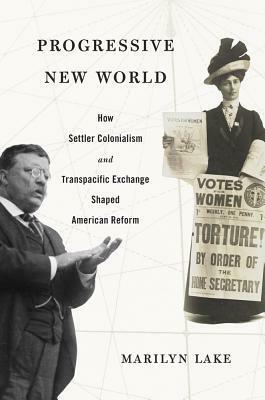 Progressive New World demonstrates that race and reform were mutually supportive as Progressivism became the political logic of settler colonialism. To ask other readers questions about Progressive New World, please sign up.